Following the death of Chingiz Khan, the Mongol empire was effectively divided into four sections, or ulus (inheritances), each governed by one of the sons of Chingiz. They remained politically united under the great khan, but their existence established the basis of future independent Mongol kingdoms. Ogedei was the selected successor to Chingiz, and was officially proclaimed great khan in 1229. While he and his successors still controlled the entire empire, they largely concentrated their attention on Mongolia and China. The rest was governed by the other sons of Chingiz. The north-western section was handed to the family of the deceased Jochi (the Golden Horde, alternatively known as the Jochid ulus as they became subdivided into several inheritances), thanks to which they inherited dominion over the Alani. This ulu also contained a strong contingent of Jalayirs, one of the core tribes of Mongols who were present at the founding of both the Mongol empire and its predecessor, the Khamag Mongol empire. Elements of their people could also be found in Persia, where they founded the Jalayirid sultanate to succeed the Golden Horde's rival ulu in the south-west of the empire, the Il-Khanate. It was Jochi's son, Batu Khan, who inherited the westernmost section of this ulu as the Blue Horde (west of the Volga), with Orda leading the eastern section as the White Horde. Chagatai Khan (the second son) inherited Mughulistan, while Tolui governed Persia. However, much of Batu's western territory was yet to be conquered by the Mongols. All they had done was stake a claim to it by conducting expeditions through its vast lands. Batu Khan set about this task with eagerness, and the Golden Horde territories eventually encompassed the Aral Sea region, the Black Sea steppes, the Ural Mountains, the Volga, western Siberia, and various principalities of the Rus. 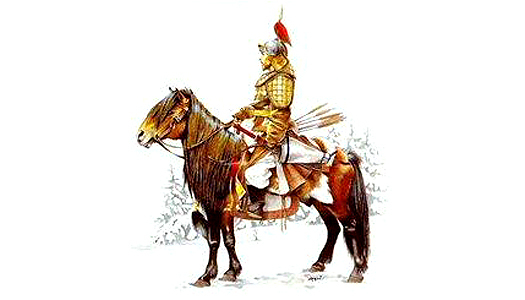 The Kipchaks or Qıpčaqs were one of the most important Turkic peoples of this period, and under the Mongol khans they dominated the western and central Eurasian steppe. Kipchak (or Gypjak) lies just outside Ashgabat in today's Turkmenistan. The Kipchaks appear in the various Arabo-Persian, Byzantine Greek, Latin, Slavic, Mongol, Chinese, Georgian and Armenian accounts under several names, aside from variants of Qıvčaq, Qıbčaq, and Qıpčaq. Versions can be found such as Qaŋlı (Latin Cangle - or Cangitai for their eastern branch), and Cuman (Quman for their western branch), plus a version of the latter which entered into the Slavic languages: Половци. Son of Great Khan Chingiz. Governed Central Asia in his name. Jochi's legitimacy as the eldest son of Great Khan Chingiz Khan has always been open to question, as he had been born shortly after the return of his mother, Börte, from captivity by the Merkits. It is probably thanks to this (at least in part) that he is overlooked as his father's successor as great khan. Jochi dies approximately six months before his father but his family are confirmed as rulers of the Golden Horde by Chingiz Khan himself. Between them, the Blue Horde and White Horde inherit just four thousand of the original Mongol troops and have to recruit heavily from amongst the population of their captured territories, which introduces a very heavy Turkic identity into the horde. Son. Gained the Blue Horde as his inheritance. Shiban is too young when his father dies to gain any territories himself, despite being one of Jochi's sub-commanders of the subsidiary White Horde. Instead, his descendants, the Shaibanids (the Grey Horde), carve out their own territory in the fifteenth century in Turkestan when they conquer Transoxiana and Southern Khorasan at Herat. Batu's other brother, Orda, commands the White Horde. Batu Khan begins the invasion and conquest of the lands of the Rus, with Subedei agreeing to accompany him. They cross the Volga and within a year have conquered the Volga Bulgars, Alani, and Kipchaks. Then, having been refused in their demand that Yuri II of Vladimir submits, they take the city of Riazan on the River Oka after a five-day catapult assault. Then they take Kolumna and Moscow, and defeat the grand duke of Suzdal leading the most powerful force in the northern half of the Rus lands. During the invasion, Kiev is conquered by Danylo Romanovych of Halych-Volynia, creating another target for a Mongol attack. Cumans and Kipchaks (possibly one and the same people according to details shown in the main introduction, above), and other nomadic groups flee the Rus lands to seek refuge in Hungary. As Batu Khan sees these people as his subjects, news of their departure is not welcomed and plans are laid to pursue them. Novgorod survives the tidal wave of conquest because the Mongols are unable to find a route through the marshes. Instead, they attack Kozelsk, which inflicts an unusual defeat on their vanguard before falling. Its entire population is slaughtered as an example. Kiev also falls after a brave defence (by 1240), even though Prince Michael of Kiev flees beforehand. The city is largely destroyed. After devastating the already-subjugated Crimea and subduing Mordovia and Kipchaks on the steppes in 1238, Batu Khan and Subedei turn their attention to Europe in 1239. The Mongols enter Galicia, capturing the capital and destroying the cathedral there. Both Poland and Hungary are conquered in 1241, with European defeats at Liegnitz and the River Sajo. However, the death of Ogedei Khan causes the Mongols to withdraw, with Batu Khan intent on securing his conquests in the lands of the Rus. He holds onto Galicia, though, which remains a Mongol possession until his death. Even after relinquishing direct control, the Mongols retain suzerainty over the state. With rising tensions between Great Khan Guyuk Khan and Batu Khan, it is only the former's early death that prevents a civil war from erupting between them. Oghul Ghaymish becomes regent during the election process that selects the next great khan, but the mighty empire has been shown to be prone to disunity. Son. Possibly a convert to Christianity. With the death of the formidable Batu Khan, the Mongols are driven out of Galicia. Even so, with the Golden Horde remaining located mostly to the south and east of Galicia, they retain suzerainty over the state. The following year, Sartaq dies after just a year as khan of the Blue Horde, possibly poisoned by his uncle, Berke. Brother or son. Acceded aged 10. Regent. Gained power in the same year. Brother of Batu Khan. Converted the Blue Horde to Islam. A Mameluke who had been born a Kipchak Turk and who had been captured by Mongols and sold as a slave, now becomes sultan of Egypt. Sultan Baybars makes the sultanate a force to be reckoned with against later Mongol incursions. Meanwhile, at Karakorum, there is disagreement about the choice of successor as great khan. The two claimants, Kublai Khan and Ariq-Boke, engage in civil war which lasts four years. During this period, the slaughter of so many thousands of Muslims at Baghdad in 1258 by Hulegu of the Il-Khanate has enraged Berke Khan. War erupts between the two, with the side-effect that Berke is forced to cancel a planned invasion of Europe. Alughu is appointed to take control of the Chaghatayid khanate by Ariq-Boke, deposing Orqina Khatun in the process. He also takes advantage of the unstable situation by revolting against Ariq-Boke's rule of the west and gaining the allegiance of the governors of Transoxiana. With both German crusaders and Lithuanians from the Baltics impinging on the territories of the various Rus principalities that are still vassals of the Golden Horde, Mongke Temur sends troops to Novgorod to eject the Livonian Knights. Smolensk is the last of the independent principalities of the Rus, but it now falls to Mongke Temur. The following year he defends his Rus vassals by dispatching a Mongol-Rus force to ward off the Lithuanians, an action requested by Duke Lev I of Halych-Volynia. Son of Toqoqan. Gt-grandson of Batu. Overthrown by Nogai Khan. By the time he overthrows Tode Mongke and replaces him with Tole Buga, Nogai Khan is a powerful kingmaker and ruler of his own subsidiary Golden Horde khanate. Known as the Nogai Horde, it encompasses a large chunk of territory on the northern side of the Caspian Sea, and the entire section between the eastern Caspian and the Aral Sea. While not strictly independent, Nogai rules the people of his horde directly, and it survives him as a confederation of about eighteen Mongol and Turkic tribes. Son of Tartu. Gt-grandson of Batu. Tole Buga is not happy with the direct threat to his own power that is posed by Nogai Khan. The loyalty of the Rus principalities is divided between the two of them and the unity of the Golden Horde is threatened. When Tole attempts to bring matters to a head, he is outmanoeuvred by his supposed subordinate and is arrested. Nogai has his replacement, Toqta, execute him. Son of Mongke. Last non-Muslim khan. Toqta Khan attempts to end the semi-independent rule of the Rus vassal princes by sending his brothers at the head of an army that devastates no less than fourteen towns. Toqta himself forces Grand Prince Demetrius of Vladimir to abdicate, which is an important victory in itself as he is an ally of Nogai Khan of the Nogai Horde. The Rus record the campaign as the 'harsh-time of Batu returns'. With the death of Kublai Khan, the Yuan dynasty survives under his successor, but the Mongol empire effectively ceases to exist. There are no further Khakhans (great khans), and command of the empire's territory is now permanently divided into four distinct and fully independent kingdoms: the Golden Horde (made up of the Blue Horde and White Horde), the Il-Khanate, Mughulistan, and Yuan China itself. The power struggle between Toqta and Nogai Khan flares up into open conflict, but Toqta loses the first battle. Nogai does not follow up on his victory, so the following year Toqta is able to inflict a decisive defeat upon him. With the threat of a break-away khanate ended, the Golden Horde is fully under the control of one khan again. Nogai's son, Chaka, flees first to the Alani and then to Bulgaria where he briefly gains the throne as emperor. Soon afterwards, with the Bulgarians aware of Toqta's anger at this, Theodore Svetoslav sends Chaka's head to his Mongol overlord and replaces Chaka on the Bulgarian throne. Nogai's territories, which reach from the Crimea and the southern Rus principalities to Wallachia, are divided by Toqta between Nogai's brother, Sareibugha, and his sons. The accession of Buyan of the White Horde is far from universally accepted by his own relatives. Led by his cousin, Kobluk, they win support from Du'a of Mughulistan. 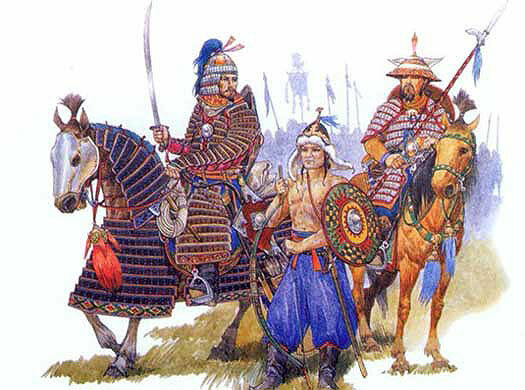 Buyan fights them on several occasions and seeks help from Toqta as the senior khan of the Golden Horde. Toqta warns off the Chaghatayids, and supplies military help. In the end, Buyan is able to defeat his opponents and emerge victorious. Grandson of Mongke Temur. Converted to Islam. The princes of Moscow and its subsidiary states have been receiving the support of Ozbeg, partially because the khan's sister, Konchaka, is married to Yuri Danilovich of Moscow. The princes of Moscow are opposed by the princes of Tver, their westward-leaning relatives, and it is the most senior of these, Mikhail of Tver, who defeats Yuri at a village named Bortenevo. Mikhail also manages to capture Yuri's wife, who subsequently dies in his keeping. Yuri announces to Ozbeg that Konchaka had been poisoned, so he and Mikhail are summoned to the Golden Horde's capital of Sarai for trial. Mikhail is found guilty and is beheaded the following year, while the yarlik (effectively a patent of office for the title of 'Grand Prince of Vladimir') is granted to to Moscow. The sons of Mikhail, Dmitry (or Dmitri) and Alexander Mikhailovich, fight a series of battles against Yuri Danilovich of Moscow. By intriguing with the Mongol royal court, Dimitry manages to gain the yarlik for Vladimir in 1322. Yuri is killed by Dimitry in 1325, before he can clear his name and regain the yarlik. Ozbeg arrests Dimity for the murder and executes him in 1326. The brothers and co-rulers of Halych-Volynia, Andrei and Lev II, die together in battle against the Golden Horde, leaving no heir. Their sister, Maria, becomes the heiress of Galicia-Lvov. Already married to Trojden I of Masovia, the duchy is drawn closer to the Polish crown, removing it from Mongol influence. 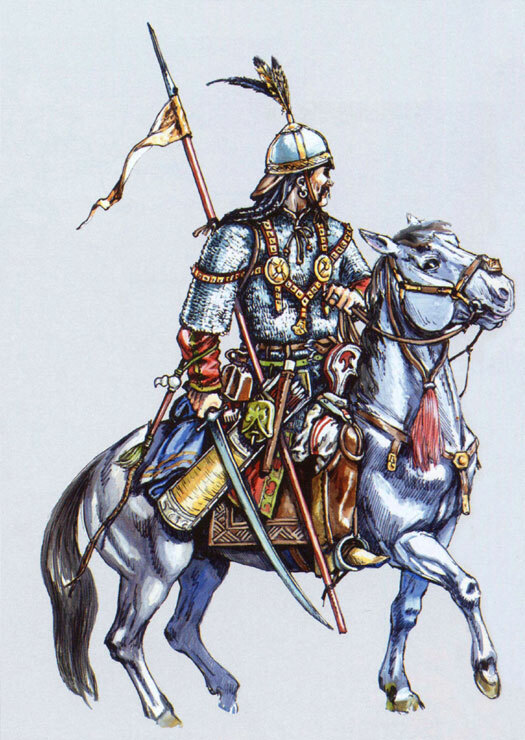 Baskaki Shevkal, cousin to Ozbeg Khan, is killed in Tver along with his Tartars, and rebellion is ignited against the Golden Horde's overlordship. Grand Prince Alexander Mikhailovich of Tver is forced to flee, first to Novgorod which refuses him, and then to Pskov. Not only does Pskov welcome him, it makes him the ruling prince. The Golden Horde sends an expedition that consists of 50,000 Mongol-Tartars and Muscovites led by Ivan Danilovich, brother and successor of Yuri. The uprising in Tver is brutally suppressed, and Ozbeg appoints Ivan as grand duke of Vladimir in 1328, which marks out his seat at Moscow as a position of some power. Lithuania defeats the boyars of the Rus and occupies Kiev and its surrounding territory. The loss of this vassal state by the Golden Horde removes not only it from their control, but also cuts off Wallachia whose ruler, Basarab I, effectively becomes independent, although this has increasingly been the case for several years. However, despite this setback, Ozbeg is still able to threaten the Bulgars, Byzantium, and the Lithuanians themselves. Almost as soon as he has gained the throne, Arpa Keun of the Persian Il-Khans faces an invasion by the Golden Horde under Ozbeg Khan. This is defeated, but the following year he is attacked by Oirat 'Ali Padsah, the governor of Baghdad. Padsah defeats him on 10 April 1336 near Maraga and soon afterwards he is captured and killed, ending the Mongol-descended Il-Khan dynasty. This triggers a period in which several rival Mongol successor states, such as the Chobanids and the Jalayirids, jostle for control. The latter seize Baghdad and rule south-western Persia from there. The entire region undergoes a period of anarchy and civil war. Son. Possibly murdered by Jani Beg. Brother. Assassinated by Berdi Beg. Jani Beg leads a massive Crimean Tartar force against the Crimean port city of Kaffa. The assault turns into a siege which is lifted by a Genoese relief force. Two years later, Jani Beg returns, but the second attack against Kaffa is defeated by an outbreak of Black Plague. There is a possibility that Jani Beg's army catapult their infected fellow troops into Kaffa so that the defenders will become infected. The ploy fails to bring the city to its knees, but infected Genoese sailors subsequently take the Black Death with them back to Italy. With the assassination of Jani Beg, the political cohesion of the Golden Horde begins to disintegrate. Berdi Beg is probably behind Jani Beg's death, and his reign as khan is not universally accepted. The khanate goes from being able to claim titular dominance over the three ulus (Blue Horde, White Horde, and Chaghatayids) and actual dominance over the Rus to internecine warfare and the possibility of complete dissolution. Their territory is curtailed to the southern Ukrainian steppes and the Crimean peninsula. Son. No heir. Assassinated by Qulpa. Berdi Beg is assassinated, and again a brother is the culprit. The Blue Horde collapses, becoming engulfed in a period of anarchy. A rash of short-lived khans attempt to reign during this brief period, the first of them being Berdi Beg's brother, Qulpa. Some khans rule only segments of the horde, competing against rival claimants, while military governors occasionally exercise de facto control. Brother. Assassinated by Nawruz Beg. Brother. Assassinated after less than 6 months. Descended from the same Borjigin clan as Chingiz Khan, Mamai is a powerful military leader in the Golden Horde and also governor of the Crimean peninsula. During the khanate of Berdi Beg, Mamai had gained the office of beylerbay, making him head of the supreme court along with giving him the offices of military general and minister of foreign affairs. Since then he has been playing power politics with the shifting allegiances and claims for power. Now he supports the claim by Abdullah Khan to rule the Blue Horde and firmly establishes himself as the true power behind the weakened throne. His puppet khans are shown as insets. Governor of Crimea. Military general & de facto Blue Horde ruler. Son of Ozbeg Khan. Puppet under Mamai. Opposed Abdullah Khan and Mamai. Urus Khan of the White Horde succeeds in dominating the fragmented Blue Horde for approximately two years, one of its longest periods of near-stability since the murder of Jani Beg. When Urus succeeds to the position of khan of the White Horde in 1374, the Blue Horde continues its internecine fighting once more, and Mamai is probably glad to see the back of a khan that he cannot manipulate. Khan, not under Mamai's dominance. Khan, but again under Mamai's dominance. The Blue Horde is heavily defeated by the Muscovites under Demetrius Donski at the Battle of the River Vozha. Two years later the horde is defeated again by the Rus, at the Battle of Kulikovo. Mamai begins putting together a retaliatory force but is defeated by Toqtamish Khan of the White Horde in a battle on the banks of the River Kalka. Mamai flees to his base in the Crimea where he is assassinated in Kaffa in the same year by the Genoese, who are still upset that a unit of Genoese crossbowmen had been totally annihilated by the Rus while in the service of the Blue Horde. The horde itself is fully reunited with the White Horde to form a greater Golden Horde.